Create plaster of Paris pins using simple candy molds, pin backs and paint. 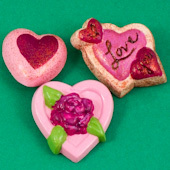 Choose a candy mold with heart shapes to create beautiful Valentine's Day pins to give as presents to your loved ones. This craft is great for any holiday. There are many plastic candy molds available with designs for almost any special day. This project requires few materials and is great for family, classroom or group craft time. Teachers or group leaders can mold the pins in advance to make this a quick and simple craft project. 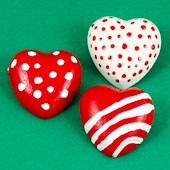 Related craft: Make a set of heart-shaped Refrigerator Magnets to give as a Valentine's Day gift. Read through the project then gather the materials needed for making the pins. 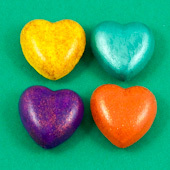 When purchasing candy molds, select fairly simple heart shapes that measure about 1½" to 2" in size. If doing this craft with a group, mold the pins and set the pin backs in advance. It takes up to 48 hours for the plaster of Paris to dry enough to paint. Cover the work area with waxed paper or newspaper to catch drips and splatters. Mix up a small quantity of plaster of Paris according to the package instructions, making a slightly thicker mixture. Pour the plaster mixture into the candy mold, filling each well to the top. Do not overfill. Insert the pin back in the wet plaster of Paris after it has partially set—wait about 5 minutes (see your package instructions for the exact time). Let the plaster of Paris set for a few hours, then pop the pins from the molds. To avoid peeling paint, let the pins dry for 48 to 72 hours before painting them. Paint the heart pins any colors you like—use your imagination. 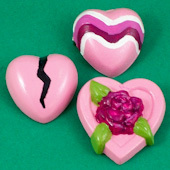 You could paint stripes or dots, write a message like those found on candy conversation hearts, or even make a broken heart. Tip: When the paint is dry, an adult can spray a clear glossy paint on the pins to give them a shiny finish. Tip: Use two colors of paint and simple designs to make bold pins. Paint the base color and let it dry before adding stripes or dots in another color. That's it! Your Valentine heart pin is done! Tip: Pins can be made from simple heart molds or those with details like flowers or words. It will take more time and skill to paint the details. Thanks to Dawna B. for sharing this classroom craft idea in Aunt Annie's Craft Exchange back in 1997. Dawna said, "I am the room mother for my son's class at school. I pre-made 30 of these pins in advance, and scraped each child's initials on the back. During the Valentine's Day party, the children painted them and I varnished them. Each student had a wonderful Valentine's Day present for their mother! To add an extra touch, I used a clear sparkling acrylic paint to seal the pins." Tip: Make a set of heart-shaped Refrigerator Magnets to give as a Valentine's Day gift. These magnets were painted with a glitter glaze.